If people actually still buy CDs, Stevie Nicks will probably sell a few copies of her latest one after her show at PNC Pavilion Saturday night. Nearly half of the songs in Nicks’ set came from “In Your Dreams,” her first studio album in 10 years. And there wasn’t the severe drop-off in quality one might expect when going from a new song to a time-tested Fleetwood Mac classic. The first hour of the 105-minute performance was an “In Your Dreams” showcase, as she did five tunes from the record. Most had a Fleetwood Mac feel, probably because of the woman singing lead. But her outstanding seven-piece band, led by ace side man and session guitarist Waddy Wachtel, played with a command and an ease that contributed to the Mac vibe. The ensemble was rounded out by backup vocalists Sharon Celani and Lori Nicks, Stevie’s sister-in-law. 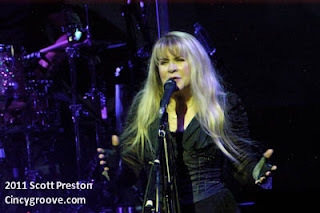 Stevie got all of her twirling for the night out of the way during the evening’s first song, her 1983 solo hit “Stand Back” (unofficial count: eight consecutive 360-degree spins). Dressed in an all black outfit topped with a red shawl, she could have been mistaken for a cast member of “Game of Thrones,” though she doesn’t owe her look to that show. Medieval has been her signature since the mid-‘70s. Great vocal and even more interesting is this version is edited down to 4 1/2 minutes - could this foreshadow "Annabel Lee" - radio single? Let's hope! Went to the concert last night and it was awesome! Stevie and her band put on a great show. My friends and I were fortunate enough to be at the stage for the Edge of seventeen walk. After we got to shake Stevie's hand, we and the ten or so fans directly around us exhanged a tearful group hug because we all got to experience giving Stevie a personal "thank you" for years of joy and music. Half of us were guys. All of us were strangers. None of this made a difference. This is the magic of Stevie Nicks. What an amazing night of music.